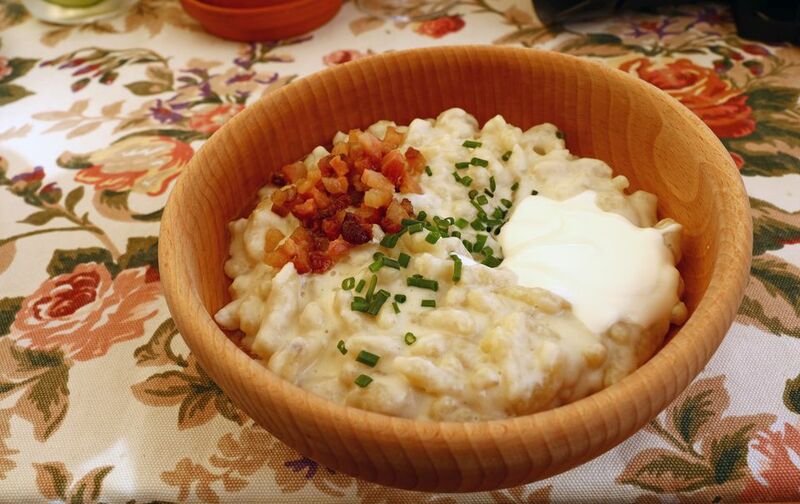 Polish hałuski (hah-WOOSS-kee) is a comfort-food dish that means different things to different people. We make it with onion and cabbage slowly sautéed in lots of butter, mixed with al dente-cooked 1/2-inch-wide noodles. Hałuski dumplings are made with a potato dough that is sometimes mixed with dry curd cheese or drained cottage cheese. Others add chopped smoked kiełbasa or ham, or ground pork and sour cream. It's a versatile dish that can be a side or main course. Hałuski is a good candidate for a potluck, buffet, game day or anytime a casserole is just the ticket. Don't confuse this Polish hałuski recipe with Slovak halušky (hah-LOOSH-kee), which are dumplings made with a grated potato dough. There are lots of variations of the Slovak version as well. Cut the round onion slices in half and then in half again so each round yields four pieces. In a large skillet or Dutch oven, sauté onion in 4 ounces of butter, stirring frequently, over low heat until very lightly caramelized. This could take 15 minutes or more. Add the 1-inch cabbage pieces and remaining 4 ounces butter, salt, and pepper to taste, and 2 tablespoons of water, if necessary. Do not cover. Sauté slowly, stirring frequently, over low heat until cabbage is tender, but not brown (cook to al dente stage if baking in the oven). This could take 30 minutes or more. If using the stovetop method, combine onion-cabbage mixture with 8 ounces cooked noodles, mixing well. If using the oven method, heat the oven to 350 F.
Butter a large gratin pan and turn the mixture into it. Bake uncovered 30 minutes or until top is lightly browned. If this dish is intended to be a meal with meat, the onions can be sautéed in diced bacon instead of the butter.